Oh my! This Teriyaki Mushroom Swiss Burger is damn good. Loosen your belt for this one! Well it happened… we got the giant snowstorm that we’d been hoping for all year. I’ll tell ya, I was like a kid in the candy store yesterday. I had been holding off on all these projects for a snow day and quite honestly, they were piling up and I really needed to get them off my plate! So I got up crazy early for a Saturday and started busting out my to do list, one project at a time. I am happy to report, that they are all done and I can move onto more important things! One of my big projects was cleaning out the refrigerator. Even though it’s still brand new, I had science projects that needed to get tossed. I was going through the condiment section and found a bottle of teriyaki sauce. I stuck my finger in the bottle to taste it and thought, “why on earth did I ever buy this”? Yuk, salt bomb. Then I read the ingredients and immediately pitched the bottle in the recycle bin. I’m glad this happened though, it prompted this weeks blog post! I had a flashback to when I was a kid skiing in Alta, Utah and having lunch at the Goldminer’s Daughter. This was the first place that I had my first “fancy” cheeseburger. I think I was 12 years old and I have never forgotten my first Teriyaki Mushroom Swiss Burger. At such a young age, I had no idea what a “to die for burger” was. Who puts teriyaki and swiss together on top of a burger? Goldminer’s Daughter did and changed my burger eating habits for life. It’s never been the same. To date my favorite restaurant burger is mushroom swiss. I love it and it’s usually my go to meal when going out. My memories of yesteryear prompted me to figure out how to make my all time favorite burger. It all starts with a good homemade teriyaki sauce. I had never thought of making my own teriyaki sauce before and could kick myself for not figuring it out earlier. It’s packed with flavors of ginger, garlic and sesame oil. You can even make it gluten free if you use tamari (I like this better than soy sauce). Turns out making your own teriyaki sauce was the clincher to the Goldminer’s Daughter burger. It had to be. As you can see from my picture, my Teriyaki Mushroom Swiss Burger looks as good as any restaurant burger. I’ll tell you it sure tasted amazing. Albeit, it was a late breakfast for me this morning but this just proves that a great burger is good anytime of day! I hope you make it. It’s so good but if you are not into mushrooms at least give the Homemade Teriyaki Sauce a try. Click on the links for more ideas that go great with teriyaki! To make the homemade teriyaki sauce: In a small saucepan over medium heat, add the Tamari, pineapple juice, vinegar, brown sugar, ginger, garlic and sesame oil. Whisk to combine well. Bring to a boil then reduce the heat to medium low. Continue to cook for 10 minutes stirring occasionally. Remove from heat to cool and set aside. This can be made in advance. To make the sauted mushrooms:In a medium sized sauce pan over medium heat melt the butter and olive oil. Add the mushrooms, garlic and a pinch of salt and pepper. Saute for 7-10 minutes or until the mushrooms are browned. Stir in the teriyaki sauce and set aside. To make the burgers: Make four patties from the beef and season with salt and pepper. Set aside. Heat your grill to 375-400 degrees. Place the burgers on the grill to your preferred temperature. 5-7 minutes per side. When you turn your burgers over place 2 slices of swiss cheese on top to melt. Remove from heat. To assemble the burgers: Place a hamburger patty on the bottom half of the bun. Top with 1 tablespoon of the teriyaki sauce. 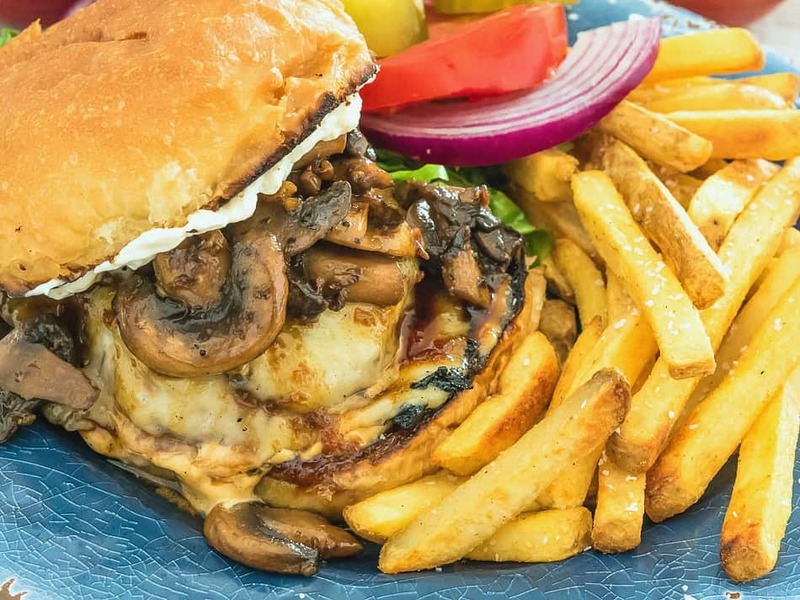 Place about a quarter of a cup of the mushrooms on each burger. Cover the burger with the other half of the bun. Serve with lettuce, tomato, onion and pickles if desired. Man does that burger sound good! Great combo. I remember the first time I made Teriyaki sauce … couldn’t believe the flavor difference. So much better. I know Lea Ann! Ill never buy the other stuff again! It’s so easy to make! It does look as good as any restaurant burger and much better than most. Thanks Larry! I wish I could eat like this everyday!